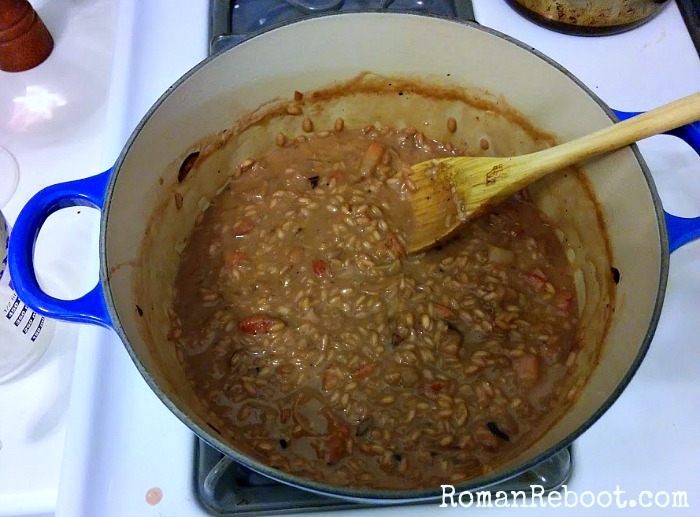 It is food week here on Roman Reboot! (You know, until I change my mind or get overwhelmed and stop posting.) But until then, let’s talk about one of my favorite things. FOOD. Something that continues to surprise me about my new gig is how often I think about food. It’s all the time. I am always purchasing food. Some of it is because I can only fit so much under the stroller. Some of it is because I just can’t seem to meal plan. But it is always something. When we have enough veggies, we are running low on meats. When we have enough meats, we are running low on eggs and yogurt. When we have enough eggs and yogurt, we are running low on canned tomatoes and olive oil. It is always something. On the home front, I think about food constantly. What am I going to make for dinner? Will there be leftovers for lunch? If no, what am I going to make for lunch? What snack can Mac eat? If I use the ground beef for chili, what should I do with the rest of the onions? Once I pick a location for a Saturday adventure, the next thing I start researching is food. Where can we find food? What time does the restaurant open? Do I need to bring food? How much food? They say the army moves on its stomach. I say the family moves on its stomach. There is no faster way to ruin a fun time than to wait too long to eat and have everyone dissolving into cranky puddles of messes. And I don’t just mean the kids. I used to spend lots of time thinking about food, but it was more fun. Less utilitarian. Ooo, which sandwich place should I walk to for lunch? Which restaurant should James and I hit next? Where should we order takeout from this evening? Now I am a grinder cook. You need dinner in 20 minutes using only bananas, bean sprouts, and chicken broth? I can do that. I recently read Shauna Niequist’s Bread & Wine. I saw bits of myself in this book, and not just because our children coincidentally have the same names. I too ran a marathon when I didn’t ever think I’d be able to. She talks about being on a punishing book tour, eating a club sandwich from room service at the end of the day, and needing that sandwich more than she knew anyone should ever need a sandwich. This reminded me of some dark moments from biglaw where I sat clutching a blondie or some sushi and thinking this food was the only thing keeping me from crying. Niequist’s stories are beautiful and real and un-put-downable. In case not your thing, a heads up that she does talk about her faith, but it is very organic. I’d definitely recommend the book. Mostly though, I found another lover of food. Niequist is definitely that. She says it took her years to be comfortable with her love of food, but now she is not afraid to own it. She gives people the gift of hospitality, coming together over a delicious meal and knowing they are loved. I love eating delicious food. I also quite enjoy hosting. But somehow I haven’t been willing to put in the work to make this happen. I’m trying to choose my words carefully here because I am worried about unintentionally offending. This is just me and my hangups here. In my 20s, I’d say I valued my career more than homemaking. It wasn’t that I didn’t value taking time at home. It just somehow felt like something I shouldn’t be spending time on, at least not as much as I should be focusing on work things. No, no, I can’t mess with making stock from scratch; I’m much too busy and important. I did have time. But with all the narrative on outsourcing, being efficient, and maximizing all of your time, spending more time in the kitchen was not something I was trying to do. Now, I usually crank out three meals a day. * This can be a chore. Something to be endured. Or it can be an opportunity to be creative. To try something new. Food is a basic need. A a mom, I’ve been worried about their intake levels from day one. Why not show them love through tasty and healthy meals? And that busy busy busy narrative just doesn’t hold water here. That is one of the things I wanted for our time in Rome. Opportunities to slow down. To take time to breathe. To savor the day to day. This is a market culture. I can stroll a few blocks and pick out fresh veggies, meats, fish, cheese, and bread. Granted, some errands can be tough with both kids, but we do have the time to explore. To find out which vendor has the best tomatoes. To ask for a cheese recommendation. To slowly learn Italian while trying to communicate how ripe I’d like my avocados. I still hit the grocery store, but I’m trying to make it to the market each week as well. And when I’m there, I’m trying to hit new vendors and stands. I’m also branching out to new markets. 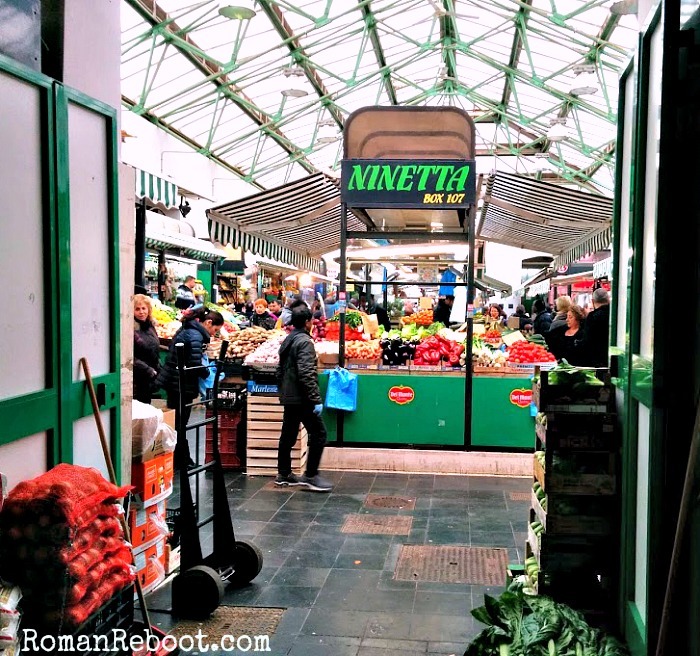 A few weeks ago we made it to the Esquilino Market, also known as the Asian market, near Termini. WHOA. This place is HUGE. 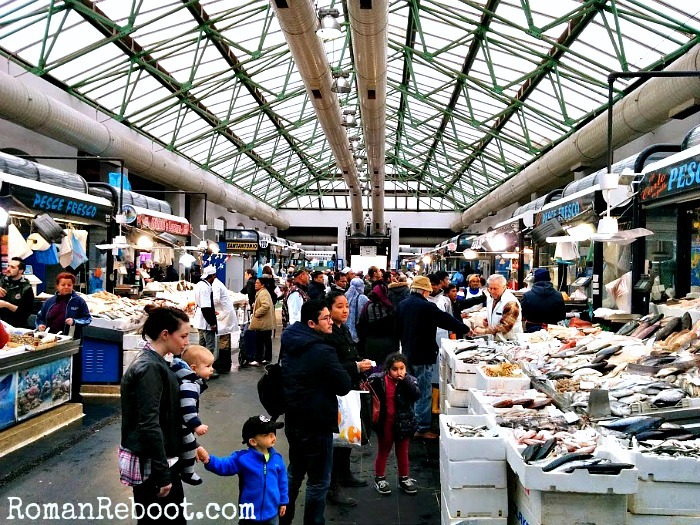 The market has clothing and other durables, but the real show is the food. Esquilino has, by far, the biggest selection of seafood I’ve found in the city. They also have vats of fresh spices. Noodles and sauces. And other things I never thought of as exotic until we moved here, like cilantro, bean sprouts, and jalapeno peppers. We stocked up on those and some candied ginger and dried pineapple. I didn’t price out every item, but many things seemed cheaper than markets by us. For example, avocados seem to be about half of what I usually pay. 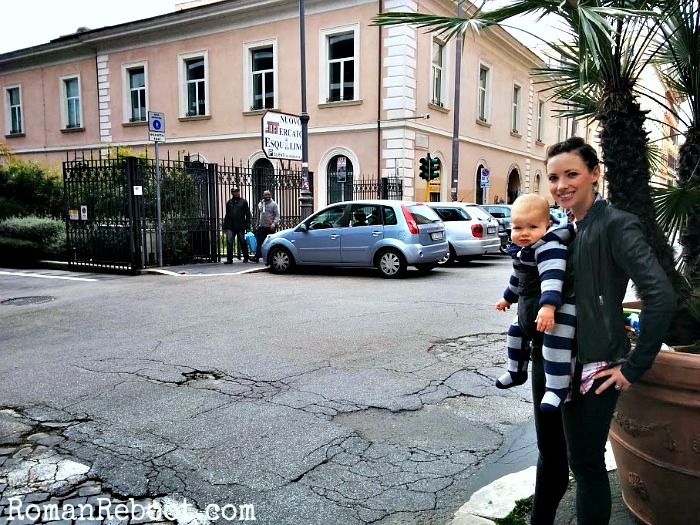 When we brought our precious cargo home, I wanted to take some time. Make something special. Nowadays, thankfully, if you can internet you can cook. I love to punch in a few of the ingredients I have and see what Dr. Google recommends. For our “exotic” treasures, I made lemon cilantro roast chicken and a roasted sweet potato and black bean salad. They both involved busting out the food processor, but it really wasn’t hard. I also made a darn tasty pork fried rice and a faux pho that turned out better than expected. I’ve been using Niequist for inspiration as well. Her book is packed with tasty recipes. So far I’ve tried her breakfast cookies, cheese-stuffed dates, mini mac and cheese, maple balsamic pork, and risotto. Ah, the risotto. You really can do anything with it. I’ve made sausage and mushroom, lemon and pea, and strawberry balsamic. I’ll never be a precise cook. (This is why James is leery of any of the rare times that I bake.) I don’t follow recipes exactly. But there is a lot of inspiration to be had, both from the internets and the amazing seasonal food here. So I’m trying. There could even be cooking classes in my future. I’m committed to enjoying food again. There will be fails. But I will try. *Please don’t think I’m cracking on James. About this anyway. 🙂 He was primary on food for years, and he does plenty else around the house. The current division of labor just has me as primary cook. 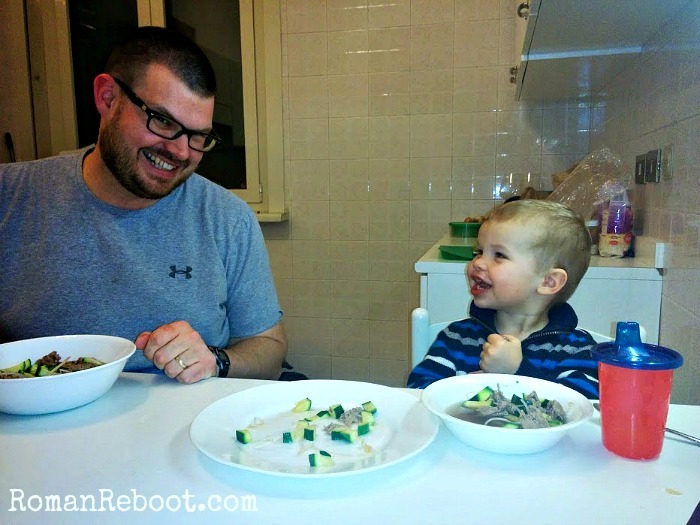 Are you in a slump or have you been food inspired these days? Any tasty recipes or techniques to pass on? I’ve heard more on Blue Apron, but it sounds like the same deal. I think it is a little pricey for every day use, but I know a blogger that uses it as a take-out or restaurant meal replacement which makes it seem more reasonable. 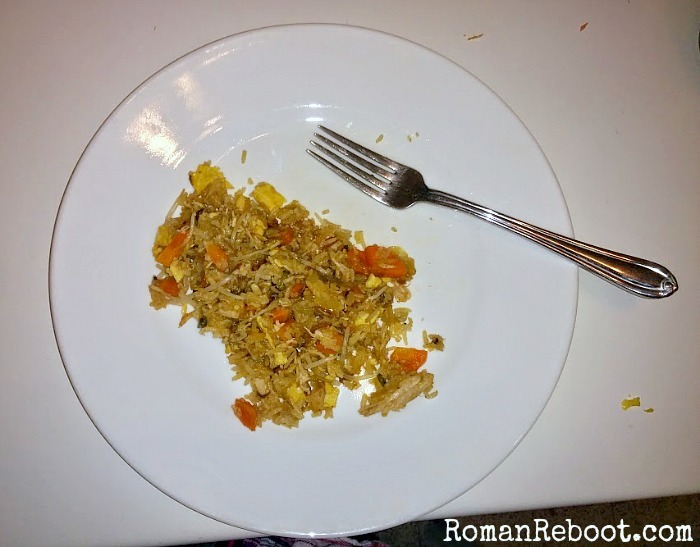 Another blogger uses it as a cooking lesson for her kid interested in cooking, which I think is pretty cool. I could totally see this being a much cheaper way than cooking classes to up your skillz.